Commercial Bank’s Deputy General Manager Personal Banking Sandra Walgama open the Bank’s 800th ATM in Sri Lanka at the relocated Giriulla branch. 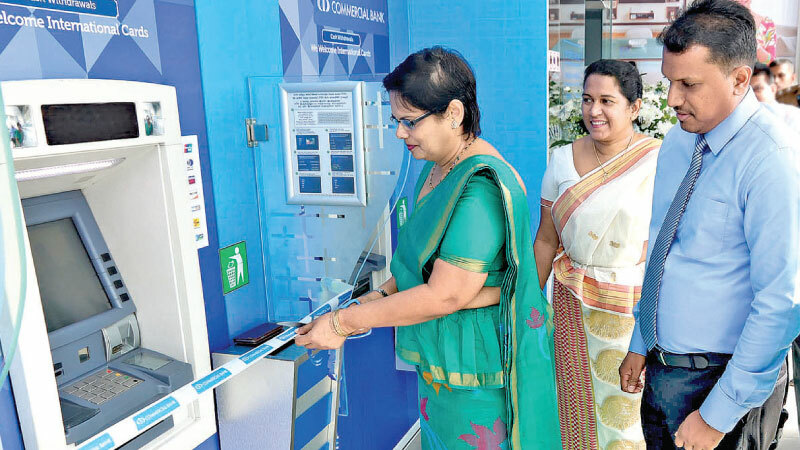 Commercial Bank of Ceylon’s ATM network, an indispensable facilitator of the daily lives of millions of Sri Lankans, reached another milestone this week with the commissioning of its 800th terminal in Giriulla, on the Negombo Kurunegala Road. The event coincided with the relocation of the Bank’s Giriulla branch to Kurunegala Road, Giriulla to better serve customers in the area as well as those passing through this busy town. The relocated branch was opened by Commercial Bank’s Deputy General Manager Personal Banking Sandra Walgama now offers three ATM machines, in addition to other facilities. The network has set and rewritten many records over the years for cash dispensed during times of national celebrations such as the Sinhala and Tamil New Year and Christmas. Commercial Bank was the first bank in Sri Lanka to upgrade its entire ATM network to EMV Chip capability, significantly enhancing security against fraud by conforming to the EMV standards of the various card brands that it accepts. As a result, every Commercial Bank ATM now accepts and processes transactions based on Smart Card Integrated Circuit (IC) data as well as magnetic strip data. About a fifth of Commercial Bank’s ATM network is located outside the precincts of its branches, with terminals installedin places such as industrial zones, railway stations, central bus stands, apartment complexes, shopping malls and large scale factories, enhancing access for customers and non-customers alike. Commercial Bank’s overseas operations encompass Bangladesh, where the Bank operates 19 outlets; Myanmar, where it has a Representative Office in Yangon and a Microfinance company in Nay PyiTaw; the Maldives, where the Bank has a fully-fledged Tier I Bank with a majority stake; and Italy, where the Bank operates its own money transfer service.